U.S. stock futures were little changed Tuesday as investors gear up for the unofficial start of the third-quarter earnings season. Aluminum producer Alcoa (AA), considered a bellwether of the economy because of its global reach, will be the first Dow component to report after the bell. It does so on the day that marks five years since the Dow and S&P 500 hit all-time highs. Analysts are expecting third quarter earnings for the S&P 500 to decline 1.4%, according to S&P Capital IQ. That would be the worst results for stocks since the third quarter of 2009. Also on tap to report Tuesday is KFC and Taco Bell owner Yum Brands (YUM), which has a big presence in China. The week will culminate with the first big bank earnings: JPMorgan Chase (JPM) and Wells Fargo (WFC) are both set to report before the market opens on Friday. Until investors get more clarity on both the earnings and economic front, trading will likely remain in a tight range. Late Monday, the International Monetary Fund projected world economic growth of 3.3% this year and 3.6% next year. It also said Italy, Spain and others will likely miss budget deficit targets this year. On Tuesday, European Central Bank President Mario Draghi testified before the European Parliament about Europe's debt problems. Draghi said eurozone interest rates are as low as they need to be, and he reiterated that the central bank was ready to start its new sovereign bond purchase program. Both events put pressure on the euro, which edged below $1.30 in early trading. Also Tuesday, German Chancellor Angela Merkel was due to meet with Greece Prime Minister Antonis Samaras, who has been seeking a two-year extension to implement tough austerity measures in order to secure the next round of bailout funds. European stocks were mixed in morning trading. Britain's FTSE 100 shed 0.2%, while the DAX in Germany lost 0.4% and France's CAC 40 rose 0.2%. Asian markets ended mixed. The region welcomed the latest intervention by the People's Bank of China, which injected 265 billion yuan into money markets. But fears also persist over a China-Japan territorial dispute concerning a band of islands and the effect it's already starting to have on Japanese exports to China. The Shanghai Composite gained 1.97% and the Hang Seng in Hong Kong added 0.5%, while Japan's Nikkei shed 1%. U.S. stocks closed slightly lower Monday. Companies: Netflix (NFLX) shares fell more than 3% in premarket trading Tuesday following a downgrade by Bank of America (BAC). Shares had risen 10% the previous day after an upgrade by Morgan Stanley (MS). Shares of Edwards Lifesciences (EW) sank 14% in premarket trading, a day after the medical device company revised down its quarterly sales forecast. Shares of drugmaker Eli Lilly (LLY) gained 1% on news that its drug -- still in the testing phase -- could slow down memory decline in Alzheimer patients with mild symptoms. Commodities: Oil for November delivery rose 75 cents to $90.08 barrel. Gold futures for December delivery rose $1.50 to $1,777.20 an ounce. 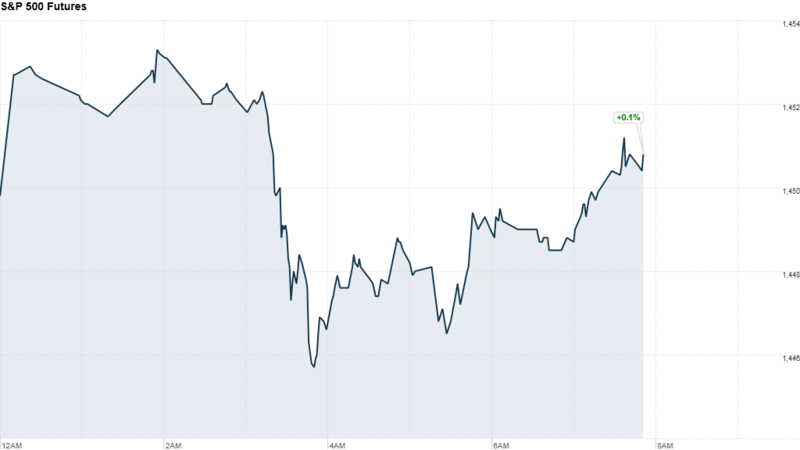 Bonds: The price of the benchmark 10-year U.S. Treasury rose, pushing the yield down to 1.71% from 1.75% late Friday. The bond market was closed on Monday for the Columbus Day holiday.